Lord is a pioneer and the world leader in adhesives solutions with more than a half a century of experience in developing and manufacturing high performance adhesives products. As a technology-based company, we’re proud to offer a range of solutions utilizing acrylic, epoxy, urethane and cyanoacrylate technologies. From electronics to automotive to construction, our product lines continue to grow. Because they adhere to a variety of substrates including plastics, SMC's and unprepared metals, Lord Acrylic Adhesives have become known as the versatile bonding agents. These Adhesives are easy to apply and bond with minimal surface preparation. have been trusted to bond body panels on more than 10 million cars and light and heavy- duty trucks worldwide. Ideal for rubber, SMC, plastics and metal applications, these adhesives provide high-strength adhesion that often has greater load-bearing capacity than the substrates they bond. are the logical choice if you're bonding today's high-performance thermoplastics and thermoset plastics. These one and two- component systems produce strong, flexible bonds that add stuctural integrity to assemblies made of plastic, primed metal, foams and elastomers. Instant bonds. Immediate handling strength. In just seconds Lord Cyanoacrylate Adhesives produce super-stong bonds that offer excellent resistance to weathering and ageing. These adhesives are especially well suited for trim attachment and light assembly. Manual Adhesive Dispensing System consists of a hand-held, two-component adhesive dispenser, a dual barrel cartridge and a disposable static mixer. Ideal for off-site repair and assembly. A durable, poratable, affordable, well-balanced dispense gun for production situations that do not require application of long beads of material. An easy, efficient, economical alternative to manual proportioning and mixing of half pints and quarts. 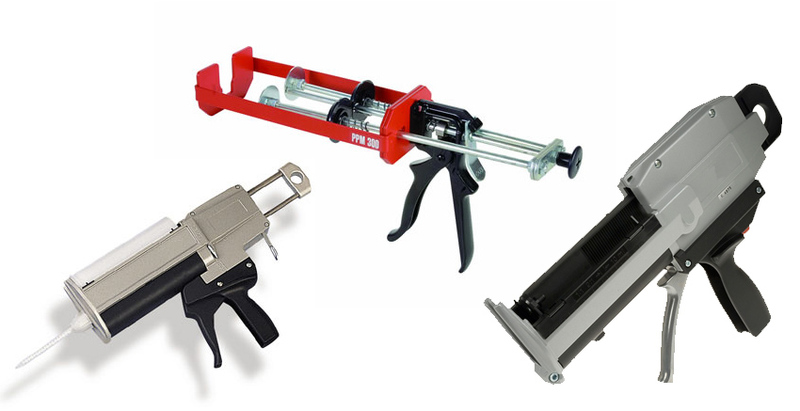 Pneumatic and Manual Adhesive Dispensing Systems are adhesive dispensing systems consisting of a dispensing gun, dual cartridge, retaining nut and disposable static mixer. The systems are available in pneumatic or manually operated versions. 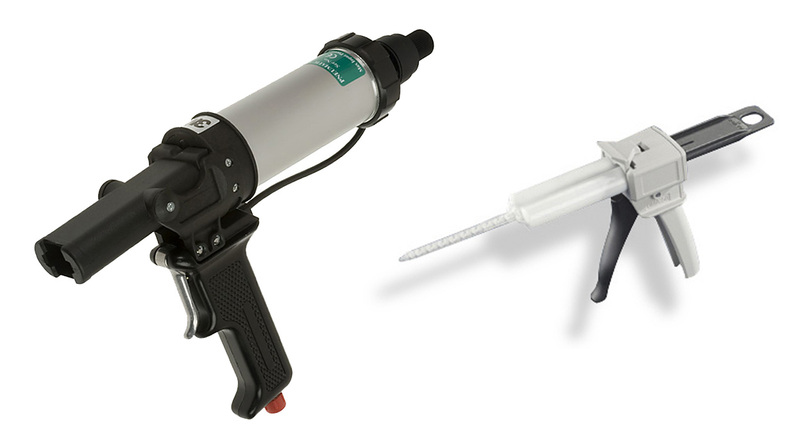 The manual version is ideal for field repairs; the pneumatic dispense gun is best in production situations. The ratios available are 1:1, 2:1, 4:1, and 10:1 by volume. Pneumatic and Manual Adhesive Dispensing Syastems Consisting of a coaxial cartridge with an inner wall seperating the two components, manual or pneumatic dispensing gun, retaining nut and disposable static mixer. The manual version is ideal for field repairs; the pneumatic is best for production situations. The ratios available are1:1, 2:1, 4:1 and 10:1 by volume.